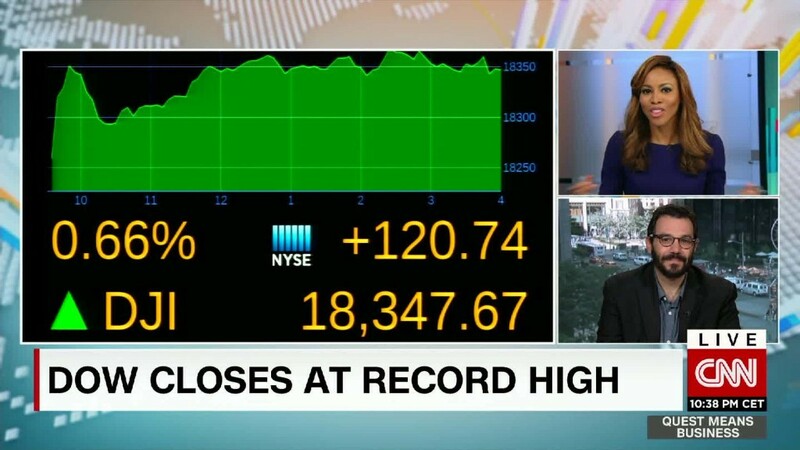 Will the Dow soon hit 20,000? Don't laugh. It's less than 8% -- or 1,500 points -- away from this milestone. To quote 1980s standup comedian Judy Tenuta, "It could happen!" And Dow 20,000 isn't as crazy a prediction as the famous Dow 36,000 one from the book by James Glassman -- way back in 1999. But who wasn't drinking the market Kool-Aid then? Here's why Dow 20K isn't that farfetched of an expectation. U.S. stocks have been riding a bullish wave of momentum for the past few weeks. The Dow and S&P 500 are back at all-time highs. The Nasdaq still has a ways to go before it hits a new record, but the tech-heavy index is once again above 5,000 -- a key psychological level. Simply put, investors are realizing that they have to put their money somewhere. European stocks are perceived as being a huge risk following Brexit. There are also still big concerns about the health of China and other emerging markets. Oil? Commodities have started to retreat again after a temporary supply shock pushed it back above $50. Bonds? Have fun doing a word that rhymes with "kissing" your money away in low-yielding Treasuries or European and Japanese bonds that actually have yields below zero. So American stocks, for better or for worse, still seem to be the cleanest dirty shirt -- a reference to a Johnny Cash lyric that bond king Bill Gross has often used to describe the U.S. markets. Investors seem to appreciate the fact that the U.S. -- despite concerns about sluggish growth and the upcoming presidential election -- is still much more stable than most other major developed and developing countries. "The U.S. is our favorite place to be. Slow growth is better than no growth," said Vince Rivers, manager of the JOHCM US Small Mid Cap Equity Fund. He added that he sat tight when the global financial markets were briefly worried about Brexit last month. He does not think that Brexit will wind up being the 2016 equivalent of Lehman Brothers. "We traded not one share for two weeks after Brexit. It was pure panic," he said. Related: Has market enthusiasm reached a 'danger' zone? John Augustine, chief investment officer with Huntington Bank, agreed that the U.S. is the best place to invest in right now. He's a little concerned about how long that can last. But he said that as long as companies report decent, if not spectacular, earnings for the second quarter and also give solid outlooks for the rest of the year then stocks should keep climbing. That seems to be the case so far. Only a handful of major companies have reported their latest results. But Walgreens (WBA) and Pepsi (PEP) -- which both have significant exposure to the U.K. -- did well. So did big banks JPMorgan Chase (JPM) and Citigroup (C) and global fast food restaurant giant Yum Brands (YUM). Augustine said that he thinks consumers will continue to spend and travel and that the housing market will remain strong. His firm's core stock portfolio owns wine and beer company Constellation Brands (STZ), household products (and Trojan condom maker) Church & Dwight (CHD), Marriott (MAR), Disney (DIS), Lowe's (LOW) and home improvement product maker Masco (MAS). Matthew Pistorio, client portfolio manager with Henderson Geneva Capital Management, also thinks housing-related stocks are a good bet. He likes Lowe's too, and holds building supply companies Beacon Roofing (BECN), Fortune Brands (FBHS) and Acuity (AYI). Pistorio said he's a little surprised by how fast the overall market has rebounded from Brexit-related worries. But he said he wouldn't bet against the market right now. The Federal Reserve seems to be suggesting that it's in no hurry to raise interest rates again. And the latest retail sales figures for June showed that consumers are still spending -- especially on their homes. "The rally has happened a lot more quickly than we and others had thought it would. But it's a Goldilocks environment. The Fed is unlikely do anything soon and consumer spending is healthy," Pistorio said. As for the other big wild card out there, Augustine said he's not too worried about the presidential election. President Trump? President Clinton? It probably won't matter much since there could be more gridlock in Congress if either of them win. Augustine thinks there is one good election bet though -- the U.S. military. Both Trump and Clinton are more hawkish than dovish when it comes to national security. So defense contractors could be winners regardless of what happens in November. "Defense is the Energizer bunny," he said.